The party throws down in Doctor Aphra #11 as the Eternal Rur runs amok and the murder bots help orchestrate the chaos. Party members drop left and right in the carnage and it’s everyone for themselves. But the party is just getting started as the Dark Lord has yet to arrive. The issue opens with the chaos as the automated turrets open fire on the auction attendees and Rur starts slicing people up with his lightsabers. 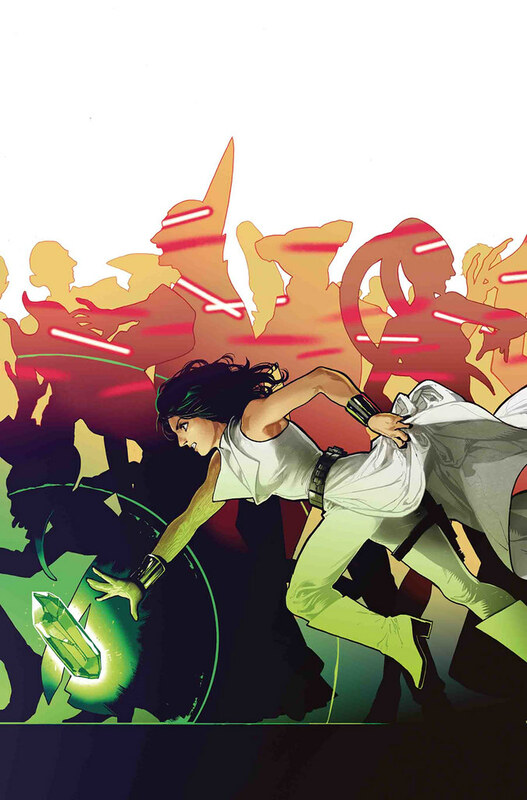 Aphra decides that her best bet at survival is to run. After a quick stop at the armory, she’s ready to fight, but Rur proves too much. The cat and mouse game continues, as does the chaos. It all comes to a head as Darth Vader arrives. The story is full of action, a few quick bursts of dialog between running and fighting, and then the big cliff hanger. However, there’s a lot unsaid. The murder bots seemingly reactivate Rur with limited powers, and they keep Aphra alive for Vader’s arrival. We know they want to kill things, but it’s not revealed what their end game is here. Are they looking for freedom? Do they think Vader will be a better master? And the even bigger question is what is going to happen between Vader and Aphra? Will she escape? Will she become his prisoner? Questions aside, the story does manage to be fun. The art isn’t too bad. Rur looks pretty cool in all of his panels. My one disappointed was with Vader’s reveal at the end as the artwork was a little weak there. Otherwise it worked overall. Doctor Aphra #11 opens up a can of worms with lots of action and ratcheting tension, but it doesn’t quite equate to a great comic. It’s still pretty good, though. I give it a four out of five metal bikinis.